Windows 10 ... for free! Windows 10 will be a free upgrade for one year if you have a Windows 7, Windows 8.1 or Windows Phone 8.1 device. 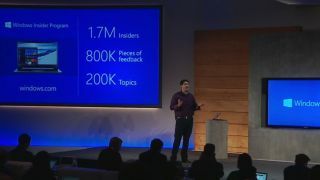 The news came at Microsoft's Windows 10 briefing, which went down earlier in Redmond, Wash.
More details on getting the upgrade are available on windows.com, but Microsoft didn't offer a release timeline for when users can expect the Windows 10 upgrade to land. What's most intriguing is that Windows Phone 8.1 devices will jump straight to Windows 10. And as Gareth Beavis notes, Windows Phone as we know it is dead while one OS to rule them all has emerged.